Who are we? 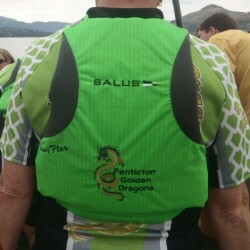 The Penticton Golden Dragons club is dedicated to enjoying the experience of being on the water, the physical activity of paddling a boat, competition of races and the sociability that comes with participating in a team sport. It should be noted that there is room in our club for the recreational paddler as well as those wishing a higher level of performance. This is the thirteenth year the club has been in existence. As a club member you have the right to vote and participate in decision-making. Members contribute to coffee and snacks that are provided after each practice. Who is our coach? Coach Brad Crittenden is returning for a ninth season with our club. He has coached winning dragon boats teams and brings a wealth of experience that he will share with our members. Who can join? We do not have age restrictions. However, in some races such as the BC Senior Games, you are required to be at least 55 years of age in the current year to compete. When do we practice? Our practices are on Tuesday and Thursday mornings from 9 to 10:30 at Skaha Lake starting in May. You should be at the Skaha Lake boathouse by 8:45 so that practice can begin promptly. All paddlers must sign a waiver form before going out the water. What does it cost? Our annual fee is $125 for all members. The first two “try-out” practices are free for new members. After that, the individual would either pay the full membership or decide paddling is not for them. Do we enter race events? Last year, we had registered to participate in five festivals. Unfortunately, two of the festivals had to be cancelled – Osoyoos due to flooding, and Kelowna due to smoke from the forest fires. Our women’s team participated in the Vernon Festival in July. Both a women’s team and a mixed team participated in the Senior Super Sprints and the Super Sprints in June as well as in the Penticton Dragon Boat Festival in September. Participants in racing events share the entrance fees, which may range from $15 to $50 per person depending on the number of paddlers who sign up. Participation in the BC 55+ Games (being held this year in Kelowna) is around $100, not including travel and accommodations. Paddlers with the highest attendance will have priority on festival team rosters. Members will be expected to indicate their interest in participating in this year’s potential events at the spring picnic, Thursday April 25 12:00 PM at Skaha Park. What do you need for equipment? Paddles and life jackets are provided. However, paddlers may bring their own CSA-approved life jackets and paddles if they meet standards. Water bottles are a necessity. Remember this is a water sport and you can get wet. Cotton clothes are to be avoided, as they don’t dry quickly. Wear water shoes (e.g. sneakers, sandals, deck shoes, Tevas). In early May, dress warmly. Members are expected to buy a team jersey for the races.